Get your sense of humor in order - Mother Nature sure did! 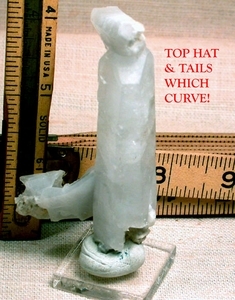 Here is a gleeful specimen of rock crystal after calcite: it's severally penetrated, has a very curved accessory crystal, glyphs of mountains and sky, record keepers, a diamond window in regrowth, AND 1/4" green chlorite dendrite which looks like dill under your loupe. Overall 3 3/8" tall x 1 3/4" wide, densely veiled with cubic voids attesting to now-vanished calcite. You won't have another like it!